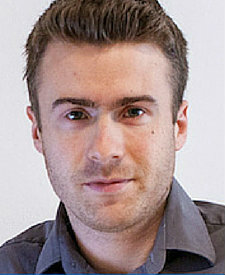 About the Author: Marco Schwartz is an entrepreneur and p2p investor with many years experience both in the fiat and bitcoin p2p lending space. On his site smartbitcoininvestment he runs a successful blog, giving valuable insights on his podcast and posting his quarterly returns. I first heard about Peer-to-Peer lending back in 2012. At that time, like many people, I only knew about a limited amount of options to invest my money. Basically, either leaving the money at the bank, investing in the stock market, or buying real estate. However, I quickly understood that Peer-to-Peer lending is an amazing opportunity for an investor, and I started to learn more about it. Since then, I invested on several Peer-to-Peer lending platform, and even in platforms that use Bitcoin as a currency (Follow the link to check out my quarterly returns on those platforms). In this article, I will share my experience with Peer-to-Peer lending platforms as an investor based in Europe. 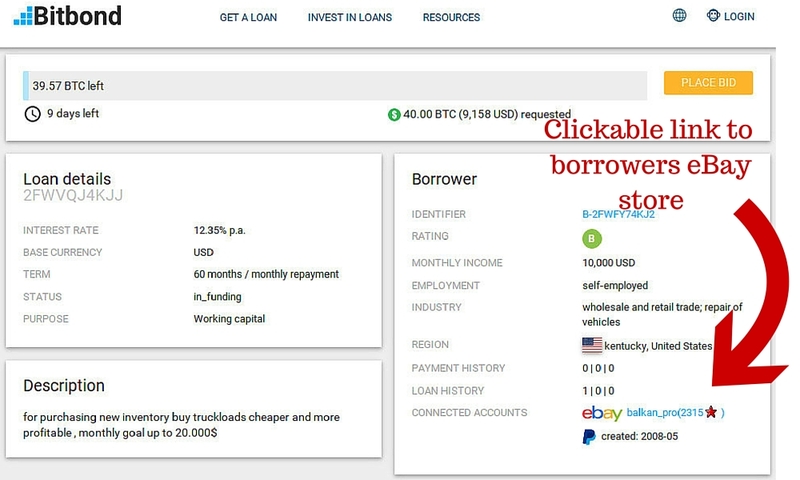 When I wanted to start investing in Peer-to-Peer lending, I immediately encountered a major problem: most of the websites where I learned about P2P lending where talking about investing on the two major US platforms, Lending Club and Prosper. That’s great, but these platforms are completely closed for European investors. The only option for an European investor would be to have an LLC in the United States, and invest via this company. And even with that option, the LLC itself should be accredited – so have more than $1 million of assets, or more than $200.000 of income per year. This was clearly not an option for me. That’s when I started to look for platforms where I could invest in as a French resident. It took some time, as there were not so many platforms available at that time. There were some platforms in the UK, but there were only for UK residents. On Bondora, it’s really easy to open an account, and then to link a bank account. If you are based in Europe, you can pay via a SEPA bank transfer, and it usually takes less than a day to get my money from my bank to Bondora. On this page, you can simply choose an investment profile, along with the expected return. It’s very easy to use, and in no time you can set a system that will invest on your behalf, every time a loan that matches your criteria will appear on the platform. I’ve been investing on Bondora for more than one year now, with a current annual return of 17%. 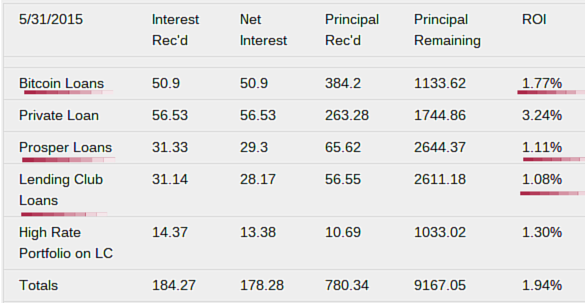 However, my default rate is currently really low, so I expect the return to drop over the next months due to some loans defaulting (the expected loss rate for the portfolio style I chose is around 8 %). This will still be incredibly high for p2p lending in Europe. 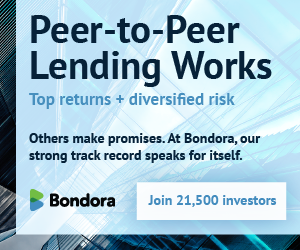 The website itself is quite similar to Bondora and to other Peer-to-Peer lending websites: you can browse loans, invest, and they also offer an auto-invest feature. It’s also very easy to add money if you are based in Europe: you can use a simple SEPA transfer, and you’ll get your money in less than 2 days on average. One key difference between Mintos and Bondora is that each loan is attached to a collateral, for example a car or a flat, that the borrower needs to put on the table in case he/she doesn’t pay the loan back. Also, you will see that some loans comes with a little yellow shield just next to the invest button. That’s another pretty cool feature of the platform: it means that for the best loans on the platform, a partner of Mintos is willing to buy back the loan in case it is more than 60 days overdue. If I had to compare both, I would have to say I prefer Bondora for their auto-invest features, but I feel like my money is safer on the Mintos platform because of collateral. As always, I really recommend to diversify amongst many platforms, like you would do by investing in different stocks for example. Even if Bondora and Mintos are my favorite platforms as an investor based in Europe, I am currently looking more and more to UK platforms. Indeed, some platforms like Assetz Capital or Saving Stream are starting to open up to European investors outside of the UK, so that’s a great opportunity to come as well. This is definitely my next move as P2P lender in Europe, as it allows me to lend to more people but it also allows currency diversification with the British Pound. In the future, I am really looking forward for many things. I think we will see more and more p2p lending in Europe, that enables any borrower or investor in the European Union to use these platforms. I think that at some point, US platforms will also open to European investors as well, as the regulations on crowdfunding & lending are getting more ‘loose’ in the US. Finally, I think Bitcoin is also an amazing opportunity for Peer-to-Peer lending, as it allows to instantly go above all the local regulations concerning Peer-to-Peer lending. If you want to learn more about Bitcoin P2P lending, I invite you to check out my blog, Smart Bitcoin Investment. Please note that this article should not be considered as investment advice. Q1 and Q2 of 2015 have been respectable for p2p investors. Prosper reported crossing $4 billion in total loans issued, and an average ROI of 6.87% for loans originated by September 2014. Lending Club announced successfully breaking through $1.9 billion in originations in Q2, while providing the average investor with an ROI of 6-8%. 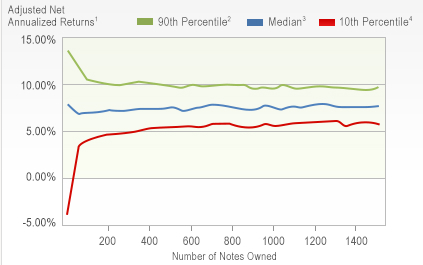 Ryan Lichtenwald, of Lend Academy and this blog, has been reporting healthy returns on Lending Club and Prosper of around 10%. Peter Renton of Lend Academy fame, reported an overall p2p lending return of 11.30% in Q2, while Simon Cunningham of Lending Memo has managed a massive 13.3% ROI on the two p2p lending giants. As you can see from the graph above, Simon, Peter and Ryan represent the 90th percentile. The rest of us can expect significantly less from our investments on p2p lending sites. So the question arises: Is there a p2p lending site out there that can bring 13% APR to the average investor and significantly more to the experts? Below, I have pasted in a screenshot of Stu’s earnings report for May, which shows his monthly ROI’s across all investment hubs. As you can see, the monthly ROI on his bitcoin loans are significantly higher than on his Prosper and Lending Club investments. Armed with this fresh piece of information I began to do some research into p2p bitcoin lending and tried to identify the key players. The three biggest p2p bitcoin lending sites are Bitbond, BTCJam and BitlendingClub. I did a little digging to find out which platform offered the best service, and decided to go with Bitbond, after I noticed they had been featured in Lend Academy. They specialise in bitcoin loans for small businesses. This is a p2p lending sector that is growing fast and one that I find particularly attractive. Other bitcoin lending platforms focus on payday and personal loans which tend to have higher default rates and which are more risky. In order to find out more about the sector and Bitbond specifically, I decided to write this first Bitbond review. Since the borrowers on Bitbond are primarily small ecommerce businesses, their borrowers are entrepreneurs who have connected several social media and eCommerce accounts. I particularly like that I can check out the eBay shops of borrowers, as I tend to trust large amounts of positive customer feedback more than the number of friends on facebook, or Twitter followers a borrower might have. 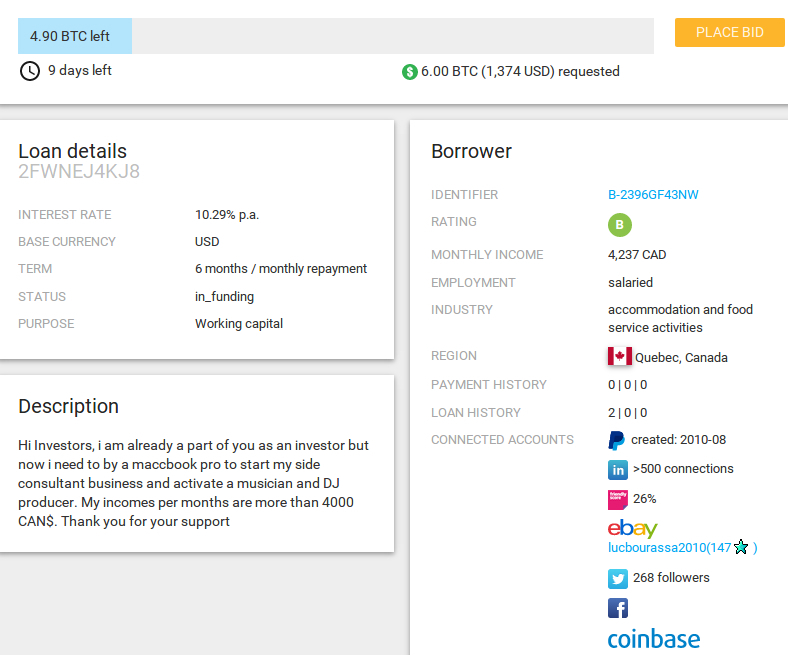 At the same time this is information that you can not find on any of the conventional p2p lending platforms as far as I know. In the screenshot shown above, you can see that this borrower from Kentucky, has 2315 positive reviews on eBay. For me, that is a signal that this person represents a good investment. 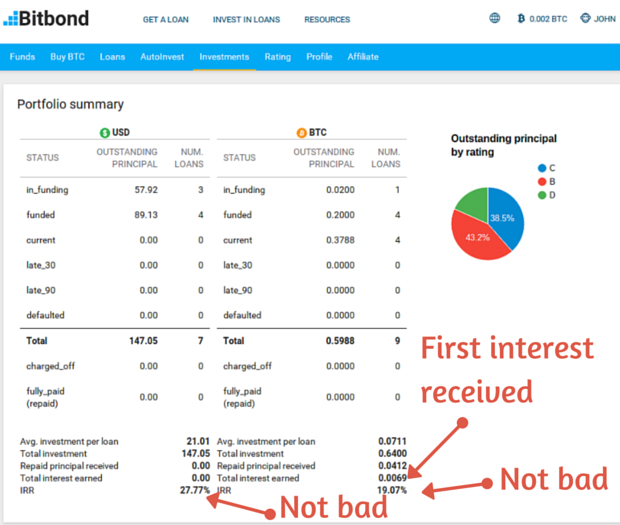 It also instilled some confidence in me that I could find reputable borrowers on Bitbond, and would get my investment back, together with an attractive +10% ROI. The first thing you notice when you sign up for Bitbond is the slick and easy to navigate interface. All the information you need is presented in a clean, easily digestible way. Below, I have included a screenshot of their loan listings page. Here you can see the amount requested by the borrower, the country of residence, the interest rates, the credit rating, the terms and denomination of the loans. This last point is worth explaining in a little more detail here. The denomination of the request determines the base currency of the loan. If the loan is denominated in dollars (green dollar sign in the CCY column) all values are calculated in USD. Thus, if the price of bitcoin should fluctuate, the repayment value and the returns investors make will remain unaffected. The top three loan listings are coloured beige, and I have no idea why. The terms of the loan can range from 6 weeks to 5 years. 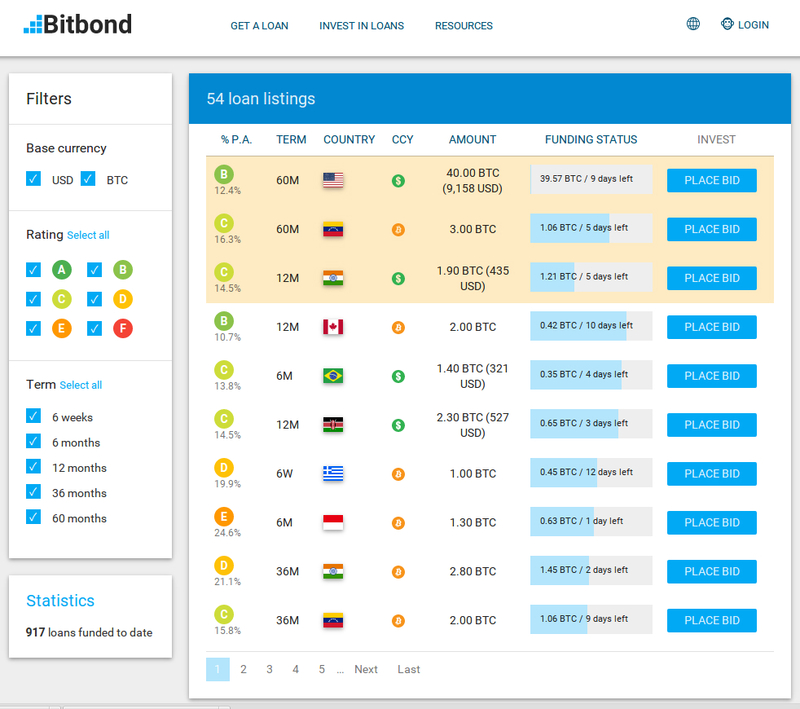 Coupled with higher interest rates commanded by borrowers from around the world, this provides some pretty attractive prospective returns for me as an investor, but more on that later in this Bitbond review. Another feature I found helpful was the ability of investors and borrowers to communicate via the comments section of the loan listings pages. 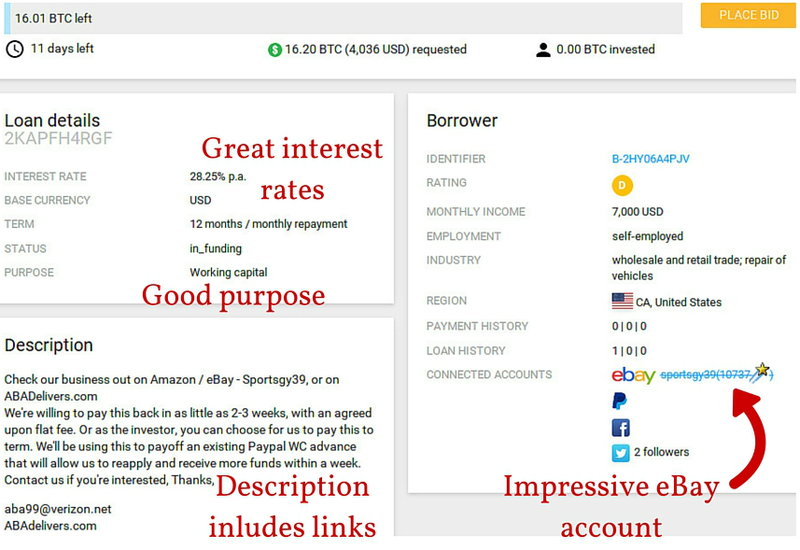 This feature allows you to gauge your prospective investment before lending him/her your bitcoin. For me, getting to know the people I invest in is a crucial part of my investment strategy. 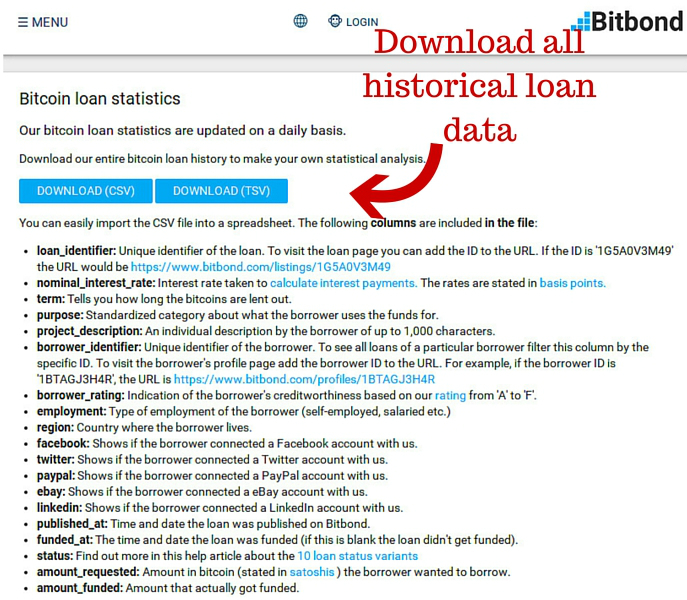 Another reason I decided to write this Bitbond review, was the availability of their historical loan data. This is an option that many of us know and value from platforms like LendingClub and Prosper. Bitbond is the only bitcoin lending platform that offers the same kind of data transparency as what we are used to from the traditional platforms. I could download this for free and easily as a CSV file on their statistics page. Access to the data is important because it allows me and other investors to create a winning investment strategy. The public availability of this data also suggests to me that they know their business model is working. Since the company is only 2 years old, the data is not yet as extensive as with the p2p lending giants, but it is enough for a start. With this information in hand, I could start to create a coherent investment strategy. I am a young, single man, so have relatively little to lose and therefore invest quite aggressively. Besides signing up, the only thing you need to get started is to buy some bitcoin. There are multiple platforms where you can do this. One that I find super easy to use is Coinbase. 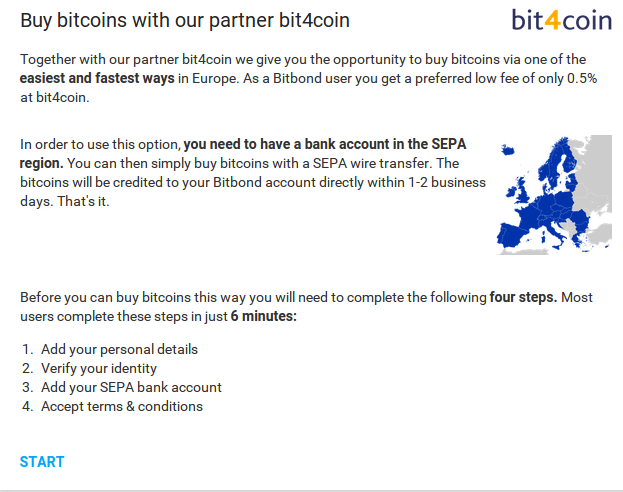 Once you have purchased your first bitcoins, you can send them to Bitbond. The deposit gets credited in roughly 30 minutes which highlights one of the many advantages of bitcoin as a payment network. Transactions are quick and at the same incur negligible fees. 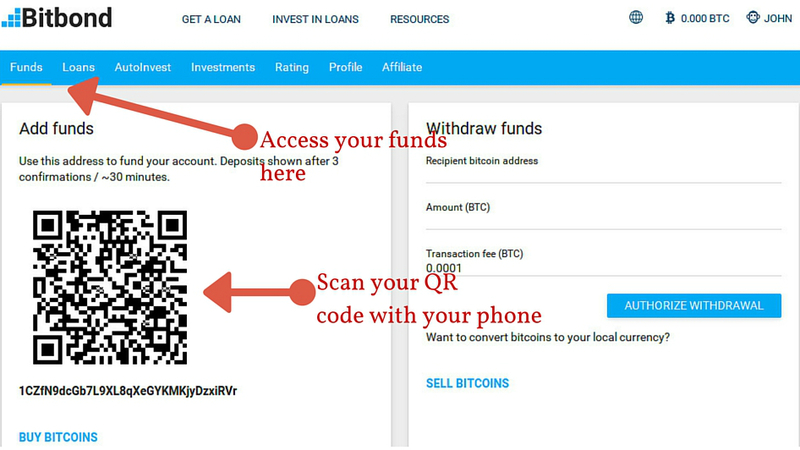 That’s all you need to do and you’re ready to make your first investment in a bitcoin loan. The first thing I did after registering (took less than 2 minutes) was check out the borrowers I might be interested in. 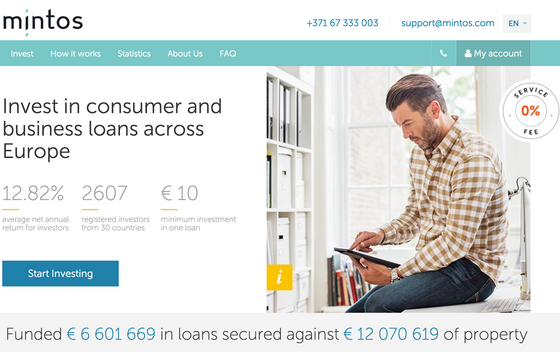 I particularly liked the layout of the individual loan listings pages. Below I have provided a screenshot of one of them. Here I can check the accounts the borrower has connected, where he is located, the size of his salary, and what the purpose of the loan is. In this case, the borrower is a man from Quebec who earns a significant wage, has impressive eBay seller feedback and a solid loan history. Thus, I decided to invest. 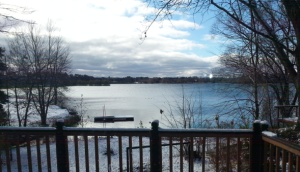 Not much at first of course, but just a little bit to test the waters. As with all investments, diversification is key in p2p bitcoin lending. What is different about Bitbond in this regard however, is the size of the bids investors are allowed to make: as little as 0.01BTC, or around $2 US dollars at today’s price. 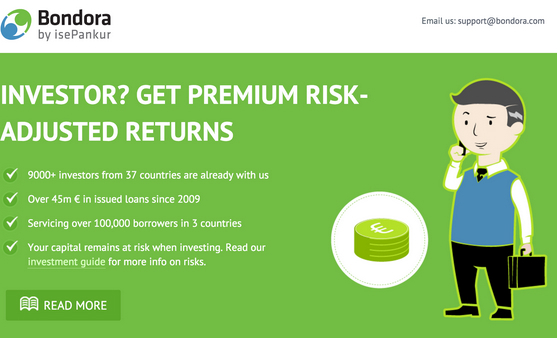 This allows me to diversify massively, across people, continents, and credit ratings, thus minimising risk. Besides the still shallow historical loan data, the number of key performance indicators available is the second weak spot worth mentioning here. 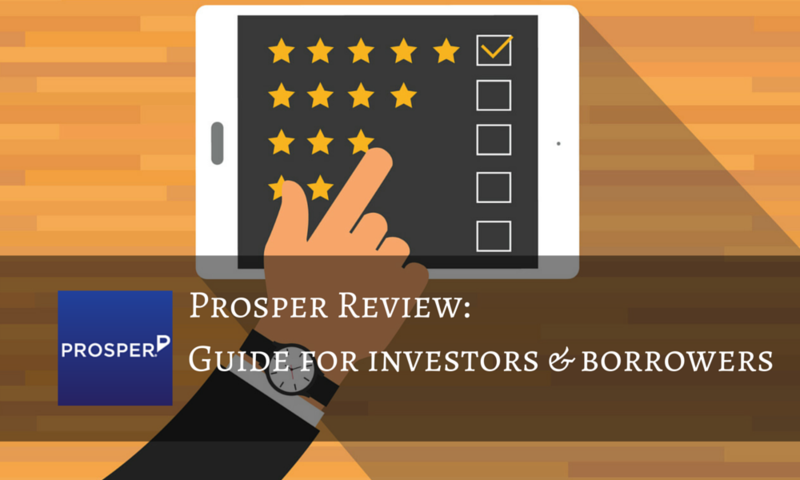 Compared to Lending Club and Prosper, Bitbond does not provide a significant number of KPI’s, and has no graphic or visual display of any of its data. That being said, the CSV file available for public consumption, definitely benefitted me and helped me create my (hopefully) winning investment strategy (more on that at the end of month). 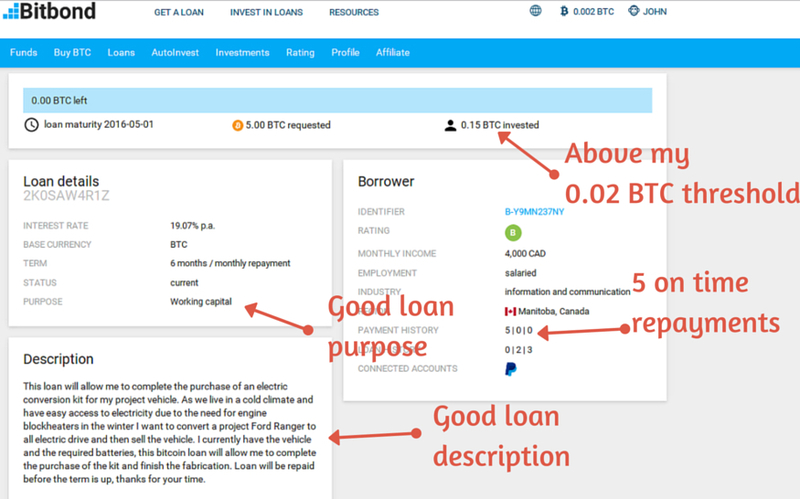 Bitbond offers a high yield alternative to p2p lending sites. As Stu has shown in his monthly reports, bitcoin loans have the potential to outstrip the ROI of p2p loans. As investors, we should focus on the ROI as the key KPI to keep in mind. This is by no means a call to abandon Lending Club and Prosper. They have shown that they can produce healthy returns on our investments. However, in 2015 bitcoin lending should be part of any healthy portfolio which aims to diversify and minimise risk. Thus, the 13% average APR advertised by Bitbond should be considered attractive. The sleek interface and good user experience, coupled with the ability of small and large investors to yield high rewards, make Bitbond and p2p bitcoin lending an attractive proposition. Finally, I should add that this Bitbond review was just a start. I will be writing monthly updates on my returns on Bitbond, giving you an insight into my p2p bitcoin lending experiment.